When it comes to home improvement costs, window treatments–even simple ones–can really add up. Although there are some great places to buy inexpensive-yet stylish-curtains, they can still put a dent in your wallet if you have a lot of windows. And as you may have discovered, once you take the plunge and buy the curtains, you're not quite done. Then it's time to shell out for the curtain rods and hardware to hang your curtains! Perhaps you're on a budget, or just don't want to invest a lot of money because you rent your place, which totally makes sense. Pouring money into a temporary home can be a fool's errand. A quick search around the internet and some trial-and-error will quickly reveal that cheap curtain rods are exactly that: cheap. They can sag in the middle, strain too easily from weight or even bend! Rather than sink your hard-earned cash into these untrustworthy inexpensive curtain rods, try one of these (sturdy) DIY curtain rode projects—all of which should save you quite a bit of money while potentially adding a really unique look to your window treatments. If you like to decorate with nature, a tree branch can stand in as a whimsical, unexpected curtain rod. 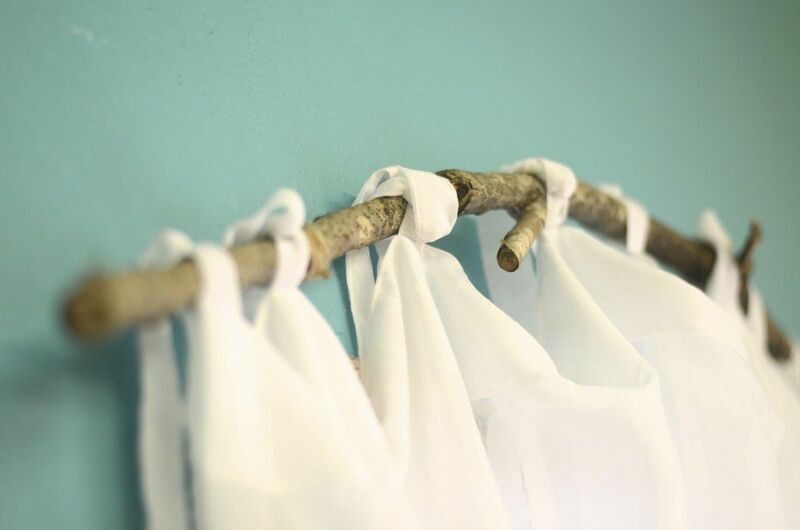 As branches aren't usually perfectly straight, this solution works best with tie-top curtains that can be adjusted to hang evenly depending on how loose or tight you fasten each tie. To give this DIY project a try, check out the guidelines from the blog The Burlap Bag, as shown above. If you want the look of a metal or metallic curtain rod for your window treatments, you can use gold spray paint to coat two ping pong balls and a wooden dowel rod. Just be sure to cut to the rod to a slightly longer length than the width of your window so you can slide the curtains all the way to each side. Here's a primer on doing DIY spray paint projects for curtain rods from Porch Daydreamer, just in case you need a bit more guidance. One thing to note about a DIY curtain rod project: It might save you money, but it could be a bit more complicated. One idea in that vein is to buy a set of hooks and screw them into a weathered board at evenly-spaced intervals. Then hang your tab-top or tie-top curtains from the hooks. Just be sure to figure out a pull-back situation so that you can expose your windows for some natural light when you need to. You can find the whole DIY project here on the blog Olive and Love. Use galvanized pipe and plumbing fittings from the hardware store for an industrial look. You could also use spray painted PVC pipe (just make sure it will be sturdy enough in the middle for your curtain material), or copper pipe for a metallic touch. Check out Chaotically Creative for the whole project, including what to buy and how to put them together. If you're looking to strike a more bohemian vibe in your home, you can use two inexpensive plant hangers placed on either side of your window, then drape a 'window scarf' between them as a decorative accent around the frame of your window. Just be sure to use a long swath of fabric and not an actual curtain, so you can have the right weight and length for this look. Looking for a truly budget option that's perfect for bathrooms or spaces where you won't need or want to move the curtain? Hesitant to put holes in the wall? 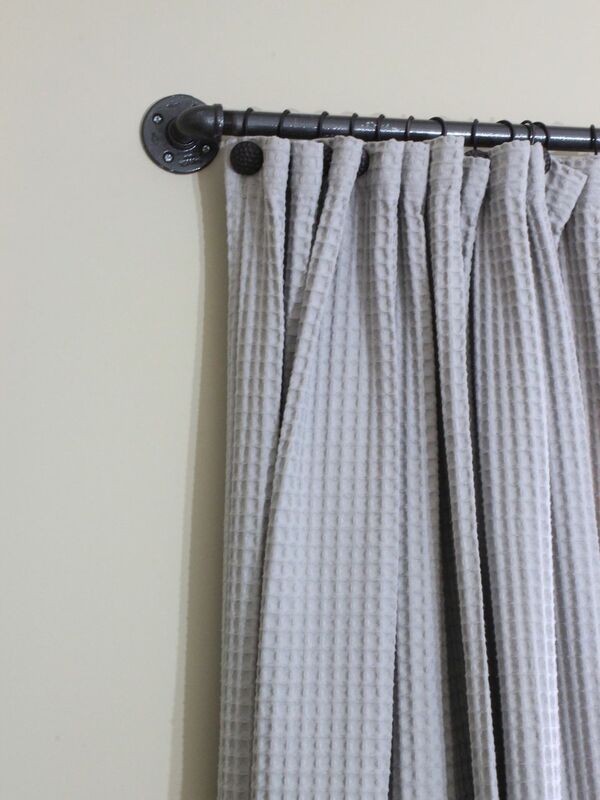 Then this DIY curtain idea is for you. Apply 3M hooks or self-adhesive towel hooks above your window (these can be found for as little as $2.97 for a pack of four), then attach curtain panels to ring clips and hang the clips from the towel hooks. If your curtains are tab-top, you could skip the ring clips altogether. Take a closer look a how to pull off this project in a stylish way on the blog Debbie Doo's.